During the river close season, and before the carp really start to wake up on my other waters, it's nice to have a go at a few other species. I'm already enjoying regular overnight outings with Gary chasing some big bream, but today I'm on my own and off to Rib Valley in Hertfordshire. Luckily for me it's only a twenty minute drive to this day ticket fishery, and always a pleasant place to while away some time. Today's target are the roach, not that I'm exerting myself too much as I've opted to fish the car park end of the lake, with it's reed fringed bank and easy casting distance to one of the three small islands, it feels like a good place to try. With only a short walk to the swim I can actually carry my tackle over and it isn't long before I'm set up. Armed with my 1 1/4 TC barbel rods, 5lb mainline, large Drennan feeders, short hooklinks fished helicopter style, with size 14 Animal hooks finishing off the rig. I popped a couple of red maggots on one, filled the feeder, and cast out fairly tight to the island, and the second rod was pretty much the same but I put half a lob on the hook this time. Initially I started feeding up a couple of spots around the islands margins. Keeping the casts going in regularly to build up a loose bed of maggots for the fish to home in on. With good sized perch here as well as the roach I was hoping it wouldn't be too long before I was seeing some action, but after a couple of hours I'd had absolutely nothing. And isn't it funny how you then start to think of all the reasons why you might not be catching? The weather was an obvious culprit, with this Spring having not really got going yet, sure we've had some warm days, but when the wind's picked up there's been a keen edge to it. Let alone the cooler days which have been damned chilly! So had the previous cold days put the fish down? Amongst all these musings, I'd noticed another angler, in my line of sight on the adjacent bank, set up his seat box, then sort his rod and plop out a float no more than thirty feet from himself. It seemed he'd had about the same luck as me until a bend in his rod signalled that he'd finally hooked something, and it was good enough to warrant the use of his landing net. One in the net at last and my hopes are high for more... and bigger! Right then, you have to learn from whatever opportunity presents itself and if the fish were showing mid-way out then that's where I needed to put a bait. So recasting to a spot between myself and the island I sat back with renewed hope. I think it was still over an hour before anything happened but I've now made contact and enjoy playing in my first roach. It's not huge, but at just under a pound it'll certainly do, and prompts me to get my other rod out to the same area. As the session progresses I have 3 or 4 more roach of the same stamp, and as the lobworm doesn't seem to be attracting anything today it's soon switched over to maggot. 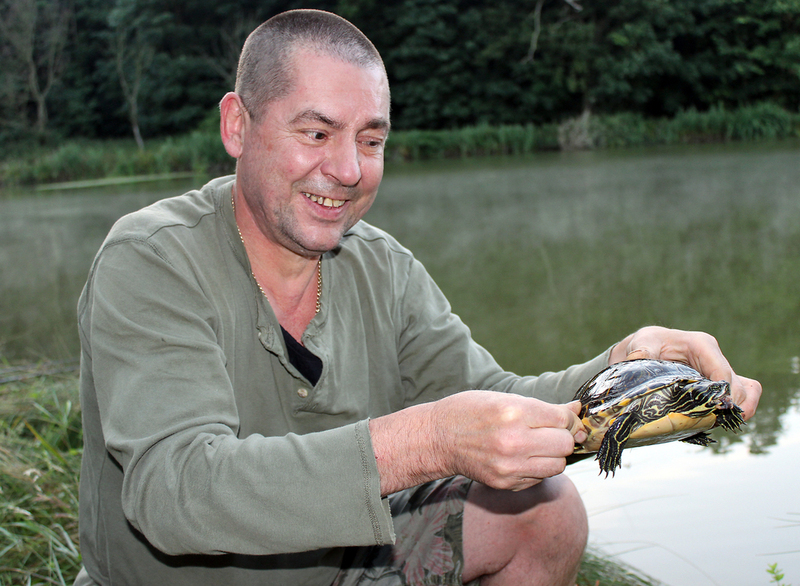 And with the regular feeding of maggots it's not long before I'm getting a few small perch in the net as well. So not the 2lb'er I was after but a beautiful scale perfect specimen all the same. It only left me to lose an even better fish right at the end of the session to leave me slightly disappointed but determined to return and catch a bigger one! And return I did, not the next week but the following one, and the first problem I noticed was that the swim I'd tried before was already taken, in fact this end of the lake had 3 or 4 guys already fishing. My fault I suppose for turning up at 9am and not at the crack of dawn to grab my spot! Oh well, it was a walk along one side of the water to an area that I've fished before, usually later in the year for the pike, but I have had a 3lb+ perch from here so I felt reasonably confident of still seeing some action. Armed with the obligatory maggots and worms, I've also brought some red sweetcorn, luncheon meat, and strawberry mini boilies, which have all worked here at some time and it's always worth having a 'change' bait in your bag in case the usual favourites aren't doing the business. I was soon into my regular 'modus operandi' and had my feeders out into the island margins hopefully building up some 'to good to pass' catch areas... but boy was I wrong! The island margins gave me nothing yet again, and so I tried several different spots, out in mid-water, between the islands, close in, and even a long chuck to open water before returning to my original spots around the island. And what do they say? So much for best laid plans, as by the end of the session all I had to show for my efforts were a couple of small perch weighing no more than a few ounces! But not to be defeated the roach quest continued the following week with me coming back for my third visit. Having had some leftover bait from a trip out with Bob a couple of days earlier, which would be a shame to waste, I had the perfect excuse to try again... err, who needs an excuse? So with plenty of maggots and lobworms I was again hoping to entice a big silver... or at least a reasonable stripey! On arrival it seems I've got the chance to revisit the swim near the car park end which produced the roach from a few weeks earlier, and it also just happened to have a brisk breeze blowing straight into it's bank, which I'm hoping might help bring in the fish. There was one angler already there, who happened to be in the next swim, but he was float fishing fairly close in, so popping out my feeders mid-water shouldn't disturb him. I'm even unwilling to turn my alarms on as this might break the spell of this lovely morning. Then while setting up I think both of us hear a couple of good fish topping at our end of the lake, but all I could spot were the circular ripples spreading out across the water once I'd looked up. They both sounded fairly big, not roach sized at all? With the rods now sitting in their rests I sit back with a cup of coffee and soak in the tranquil scene, only for another big splosh nearby to pull me out of my reverie. We were certainly not alone here! Half an hour drifts by when suddenly one of my indicators twitches, then shoots silently up to smack the underside of my rod, which is now starting to pull round rather quickly as something makes off at speed! For the next twenty minutes I'm battling with what becomes plainly obvious, is a carp. Getting it to within 15-20 feet of the bank isn't too bad, and I get my first look as it breaks the surface, it's a common, and I roughly guess it might make a mid-double. But it has other ideas as I loosen the clutch to protect the hook hold quickly remembering it's only held on by a size 14 hook, then it's soon stripping line off the reel and heading for the nearby reeds. The battle continues as I play it back to within a few feet of the net, only for it to power off not once, not twice, but three more times before I finally steer it in. Saying that, I then realize my Drennan Specialist net is no way a carp net, as over a foot of tail hangs over its edge! I also recognise I've totally under estimated the size of this fish especially now as it's lying on my rather small specialist unhooking mat. I remove the hook and return it to the net to rest as I get the scales prepared.... oh my, it goes 27lbs exactly! Resting it again I race round to the other angler who has a smile on his face and greets me with 'That gave you a good fight, a carp I presume?' I confirm his assumption and ask whether he can take a photo for me, which he's happy to do, as I'm pretty sure he wants to see my catch. As I bring the net over and lift the fish out onto the mat I think we're both impressed with such a beautiful fish, 'After the carp are you?' and as I tell him no, not really, I'm chasing the roach and only using an avon style rod, 5lb line with two red maggots on a small hook, he smiles again 'That's good angling mate' ...now it's my turn to smile. The rest of the session is a bit of a blur, and again there is a 'no show' by the roach, but I did manage a few perch to fill out the remaining hours, not that I really cared! Damned funny roach this one! But I wasn't going to complain, a close shave getting her in, rather unlike my chin!